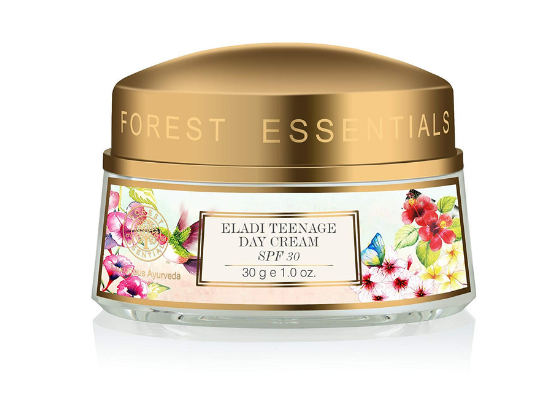 Here is one among the most different and special among the Forest Essentials products- Forest Essentials Eladi Teenage Day Cream Review. This cream is absolutely amazing and even women who are way past their teenage years testify to it. The explanation on this Forest Essential day cream goes on to say how skincare routine should start from teenage and this Forest Essentials cream for face is indeed the best for it! The packaging is impressive and the cream is luxurious! It is a perfect Forest Essentials cream for dry skin, to reduce acne breakouts and to keep skin glowing and healthy! Eladi thailam is known for its skin nourishing properties. It adds a glow to the skin and makes skin healthy. This cream is also enriched with sweet almond oil, aloe vera juice, lemon extract, clove extract, coriander extract, ficus extract, turmeric extract, neem extract, grapefruit oil, vitamin E, khus oil along with pearl extracts and silver extracts. The cream is thick in consistency and has a pista green colour. 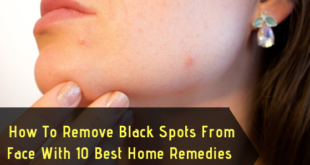 However, it spreads smoothly over skin and does not clog pores. A must have for all young (and old as well, only because it’s too good) ladies! 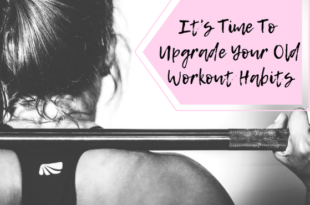 If you want to start with your anti-aging routine, you can consider starting with this one here! 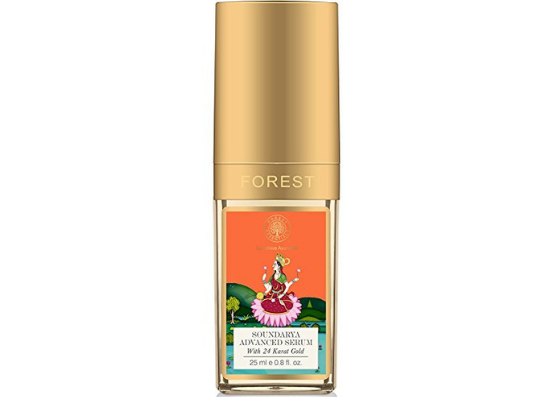 The Forest Essentials Advanced Soundarya Age Defying Facial Serum with 24K Gold. 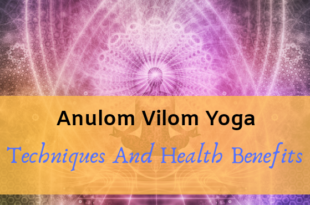 This serum is a natural and ancient beauty secret from the ayurvedic books that has been trusted to give one divine beauty. It contains natural ingredients that help to firm skin, boost collagen, work as antioxidants and also adds a warm glow to the skin; contents include cow’s milk, turmeric, 24K gold bhasm, licorice, saffron, etc. The serum by itself is dark brown in colour and spreads easily on the skin. It does not cause any breakouts or clog pores; rather it gives the skin a divine glow and also evens out the complexion. 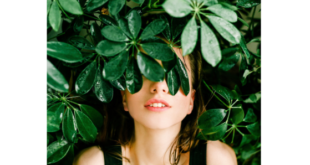 · Smells and feels heavenly! Are you looking for a mild facial cleanser to get clear skin? You must try the Foret Essentials Delicate Facial Cleanser with Kashmiri Saffron and Neem. This Forest Essentials face wash is simply amazing! Apart from being a completely natural product, it contains neem extracts that help to deep cleanse the skin and keep it free from impurities. The kashmiri saffron adds a healthy glow to the skin. Moreover, it does not strip off the skin from its moisture but adds a glow to the skin after cleaning. This Forest Essentials product for face cleansing is brilliant as an everyday face wash for mild cleansing (as it says) and not for heavy cleaning. Dry skin and combination skin people will love this, but those with oily skin might need something with more power to remove excess oil secretion. Here is a very unique Forest Essentials product. You maybe used to the regular toners and facial mists, but this one is different and interesting in its composition. 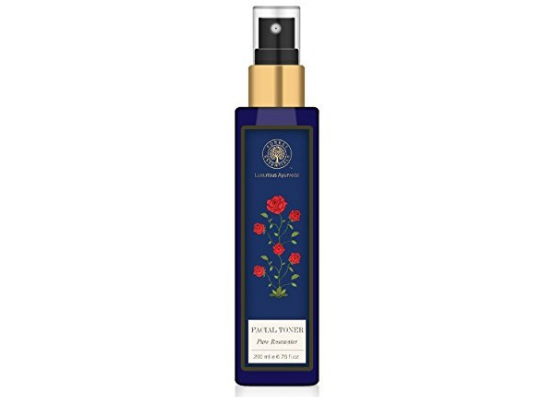 The Forest Essentials Panchpushp Facial Tonic Mist is obtained from the steam distilled water of flowers. 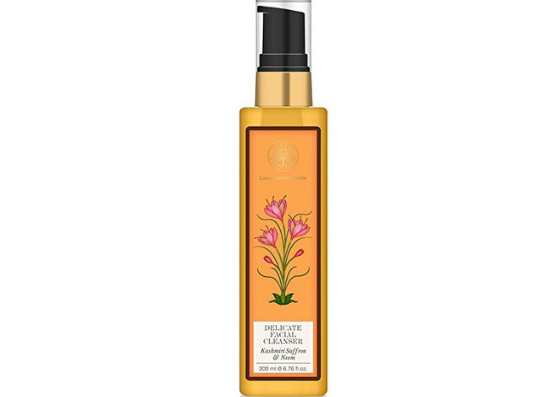 Fresh floral water of Rose, Marigold, Bela, Kewda and Saffron is steam distilled for its essential oil and the hydrating floral water residue is used for the facial tonic mist. Isn’t that interesting? This is healthy for your skin because of the composition of each of the contents. Rose has cooling, soothing and moisturizing properties. It is naturally hydrating and its seductive floral scent, promotes a feeling of well being and harmony. Marigold or Calendula has a high content of flavonoids, that act as anti-oxidants in the body. Bela helps retain moisture in the skin. 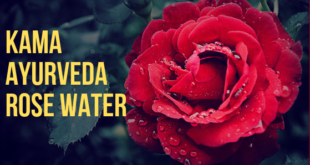 Kewda is an anti-oxidant and cools the system. Saffron gives the skin a warm glow. It claims to keep skin moisturised and hydrated. All you have to do is just use it as a toner by rubbing over some of it taken onto a cotton ball or you can also spritz it over your face and neck as and when needed. Here is a lovely choice of a light Forest Essentials face cream for normal to oily skin- Forest Essentials Madurai Jasmine and Mogra Light Day Lotion. 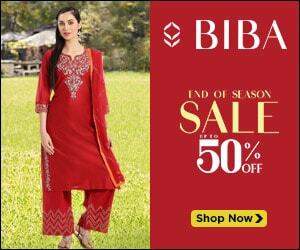 It comes with the combined pure essential oils of Jasmine and Mogra flowers. The beautiful essence of these flowers helps to hydrate skin, keep it smooth and supple, well moisturized and also protects your skin from the damaging effects of the sun; with the lotion’s SPF 25. This Forest Essentials face cream product comes with the comfortable packaging. The plastic bottle with the pump dispenser is travel-friendly and also convenient to take the required amount of product out. It spreads easily over skin, gets absorbed quickly, and stays for a solid 5 to 6 hours with its moisturising effect (after which you may have to reapply to boost the SPF again). The lotion is hydrating for the skin, light and even perfect under makeup. Oily skinned beauties can certainly give this one a try. Are you on the lookout for a facial exfoliator that will make your skin glow? If yes, then you must try this Forest Essentials scrub for face that will not alone make your skin clean but will also make it glow. 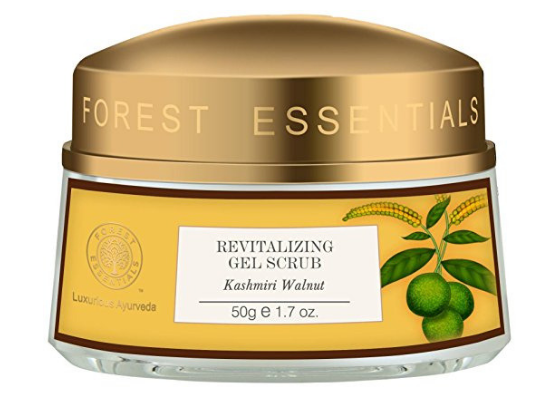 Forest Essentials Revitalising Kashmiri Walnut Gel Scrub is simply excellent! It comes in a small tub packaging and is runny in consistency. This makes it easy to apply on skin and give it a good exfoliation without having the need to mix in any water for dilution. The contents include walnut, aloe vera gel, organic fruit, roots, herbs, and vegetables. All these are natural exfoliators which leave the skin soft, smooth and glowing. Your skin does not become stretchy or dry or patched post washing. Rather, it becomes soft, supple and even gets a healthy glow. It is a very good choice of Forest Essentials exfoliator for the face. 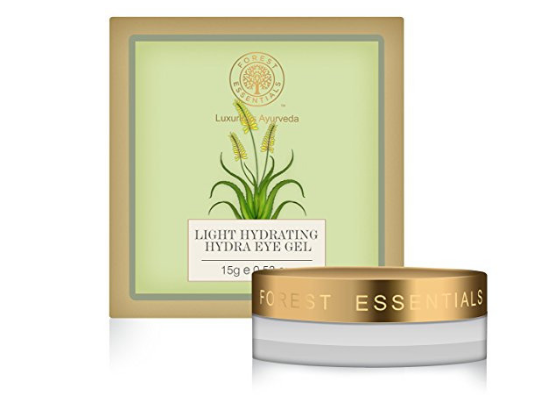 Treat your tired eyes with some gentle action of the Forest Essentials Light Hydrating Hydra Eye Gel. This Forest Essentials product certainly works like magic one must say. In no time it refreshes, soothes the under eye area to relieve your eyes from the stressed look. This under eye gel is thick in consistency, but it spreads easily and also gets absorbed into the skin quickly. You will need just a drop of it and also a little will go a long time. It contains the extracts of rice water, cucumber, rose water- all cooling ingredients to calm stressed and delicate under eye area. Soon after application, it relieves puffiness. It also brightens the eyes immeditaly. However, no effect is found with dark under eye circles or with fine lines. Maybe one should wait longer to see the effect. Here is another Forest Essentials product for face that is quite different and unique. 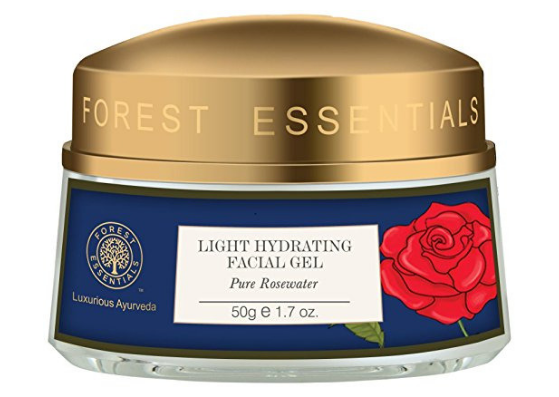 Pump in some extra moisture into your skin with the Forest Essentials Pure Rosewater Light Hydrating Facial Gel. It is rich in fragrance and texture. The gel spreads smoothly on the skin and seeps deep into it in no time. Your skin will instantly feel supple and hydrated. It is perfect to apply post toning, it will help your skin to remain moisturized. 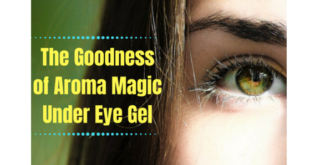 The gel is best suited for those with oily skin. Dry skinned beauties will find little to no use with gel formulation, hence it is better to avoid this. The ingredients list includes wheat germ extracts, aloe vera, cucumber, floral extracts, and rose water. Each of these help to keep skin toned, supple and hydrated. Get the best of Ayurveda with this amazing Forest Essentials product- facial ubtans. 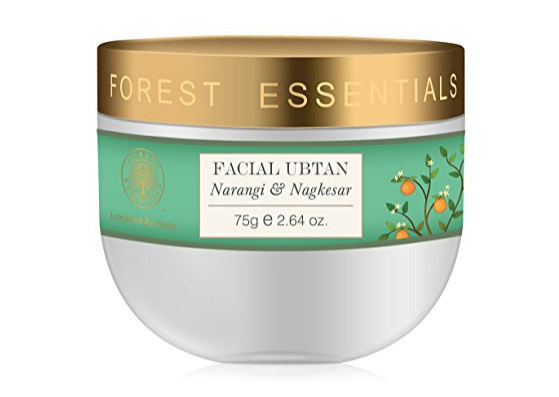 The age-old secret in the beauty regimen with the Forest Essentials Facial Ubtan Narangi and Nagkesar. Ubtans contain dehydrated herbs which become activated again by mixing with rich liquids like milk or rosewater. They claim to price instant radiance, firming and toning to the skin. This Forest Essential ubtan contains Sundried Narangi peel Sundried lemon peel, sweet almond seed, Gotkula, Camphor, Marigold leaves, Anantmool, Nagkesar, Saffron extracts. Each of these ingredients are simply excellent to provide skin with radiance and healthy glow. All you need to do is mix a small amount of the ubtan powder, mix with rose water, apply on the skin, let it dry for few minutes, use as a scrub and rinse off. 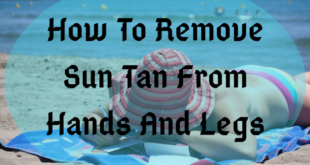 It imparts an immediate glow to the skin and also works on removing sun tanning right from the first use! This is a beauty miracle indeed. Plump up your skin with the extra hydration and care it needs at night with the Forest Essentials Sandalwood and Saffron Night Treatment Cream. It comes with many vitamins, enzyme, and hydrators to deliver vital nutrition to the skin. 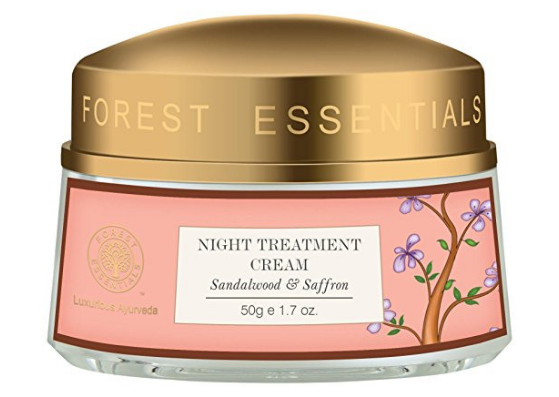 This Forest Essentials night cream for face contains pure oils of sandalwood and saffron to take special care of dry skin. Vitamin C, Vitamin A, and carrot oil are the other ingredients. Each of these work on restoring firmness of the skin, skin renewal, act as an antioxidant and to tone the skin and fight the signs of aging. The cream is thick and rich with a mild saffron smell to it. However, it spreads easily on the skin, does not cause any breakouts and also works on keeping the skin supple and moist overnight. Best for the cold, dry weathers; summers may need something better to keep oil under control. With the cold weather almost close by, your lips will need special attention to keep chapped lips at bay. 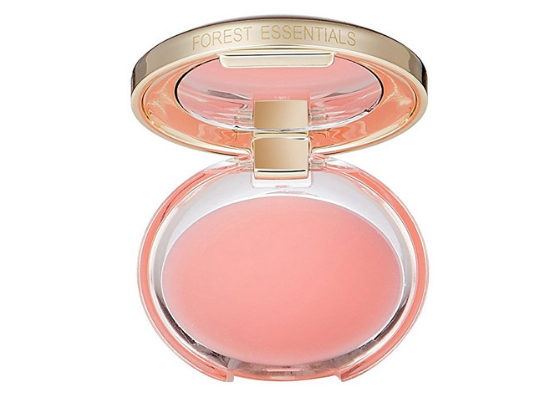 Get the moisture your lips needs with the Forest Essentials Luscious Sugared Rose Petal Lip Balm. In a very elegant packaging, this lip balm is a good Forest Essentials product to nourish dry lips. However, it might not be the ideal choice to treat chapped lips. But it certainly works as a lip balm to protect from dry lips. It contains the goodness of natural butter and beeswax that heal and hydrate the lips. It contains fresh rose petals which are soaked in honey to protect your lips. The almond oil content also helps to moisturize lips and maintain the elasticity of the skin. Here is something to let you delve into some luxurious bath time with Forest Essentials products. 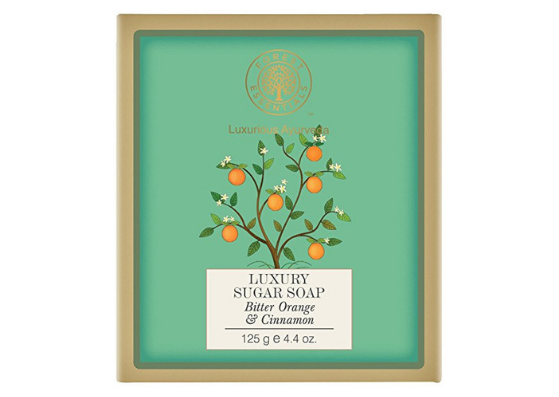 The Forest Essentials Bitter Orange and Cinnamon Luxury Sugar Soap is something none can resist. The fresh citrus smell of the orange is heavenly along with the other glorious natural extracts this clear sugar soap contains. Handmade clear Forest Essentials soaps have their own stand for the extra moisturization and care they provide for the skin. This soap contains the goodness of bitter orange, cinnamon, raw cane sugar, sweet almond oil, and glycerine. While the bitter orange works to detoxify the body, improve the functioning of the lymphatic system and work on building collagen to brighten dull skin, the rest of the ingredients equally work on reviving the natural glow to the skin and keep it filled with moisture. This is a soap one must try! Expensive for the number of days this soap will last for regular use! This Forest Essentials soap is definitely into or some luxurious action. 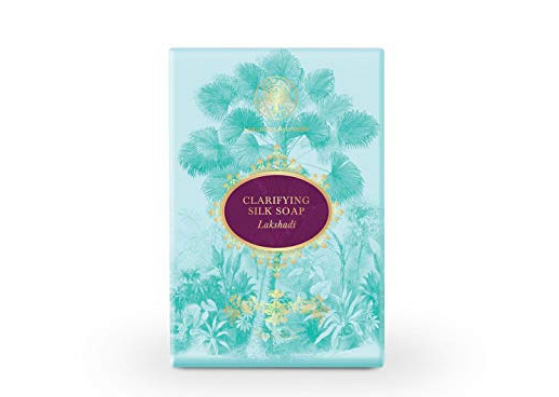 Forest Essentials brand has a whole range of luxury silk soaps and one among them is the Forest Essentials Lakshadi Clarifying Soap. It claims to even out skin tone, smoothen skin and also minimize large open pores on the skin. This soap has many special ingredients that benefit overall skin health. The product description says the soap contains the purest lac derived from Kusum trees along with fresh sandalwood paste that is infused in sesame oil which balances oil production and helps to minimize open pores. The healing properties of multani mitti and kasturi manjal clarify, refresh and protect the skin. Tea tree oil and Nagkesar treat pigmentation and evens out skin tone. Moreover, it also contains cinnamon, cardamom, geranium, clove, kokum butter, castor oil, and virgin coconut oil. It delivers hydration along with complete skin care. The soap has a pleasant earthly fragrance, due to all its rich ingredients, and it also has a brown color. It does not dry out skin, it is recommended for those with normal to oily skin, and it does a good job for them. It helps to balance skin pH and also sebum production. You may notice that your skin is oil free for a solid 3 to 4 hours. Dive into a silk bath with this Forest Essentials body wash product. Want ample amount of moisturization from a silk sower? 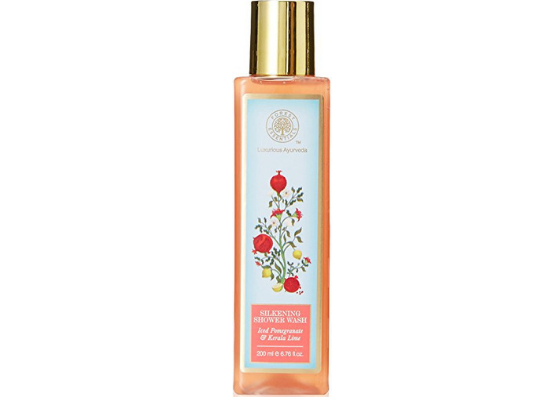 You must try the Forest Essentials Silkening Shower Wash Iced Pomegranate with Fresh Kerala Lime. The product contains an extensive list of carefully selected herbs and fruit extracts that nourish skin. Lime and pomegranate are the main ingredients. While pomegranate works as a natural sunscreen, lime acts as an antioxidant and also to cool the skin. Genhu, sonapatha, and bamboo are other contents that gently cleanse the skin and keep it hydrated. It has a refreshing smell and the texture is very smooth. The peach coloured shower wash lathers smooth on the skin and keeps it extremely hydrated, moisturized and silky smooth! A little goes a long way and it gives your body a complete luxurious bath sensation. Your skin is supple and does not feel dry or patchy post-rinse. Body polishers are amazing! 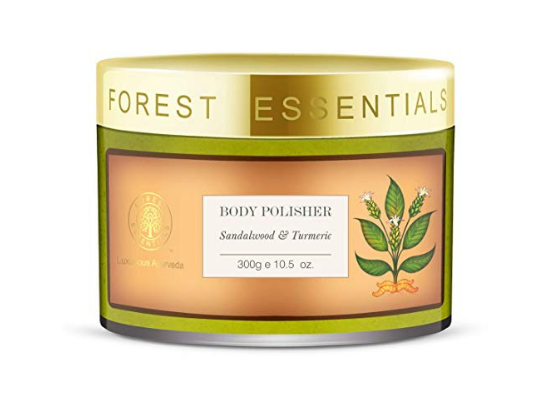 If you haven’t tried them, wait till you have tried the Forest Essentials Sandalwood and Turmeric Body Polisher. It is worth every penny paid for the glow it gives the skin. Body polishers are made with highly potent ingredients that are soaked in sea crystals, essential oils, etc. This makes them rich in moisturization. The drawbacks of the Forest Essentials product review on body polisher will let you know on the packaging and mild action. We’ll get to that in a bit. This product has a very classy packaging; comes in a cardboard board box that contains the tub of the polisher, small wooden spoon or spatula, a small bottle of oil. The tub contains the body polisher soaked in sea salt. 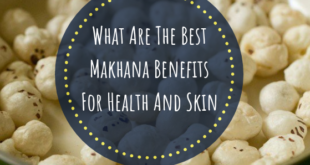 It has ayurvedic herbs like Ashwagandha and Gokharu; these are rich in antioxidants and help to detoxify your skin and push out the free radicals. It has a wonderful aroma from the sandalwood and fresh turmeric. Regular use of this Forest Essentials product is said to give you smooth, glowing skin. The tub packaging is not travel-friendly. When you think the contents are drying out, you can add some more oil provided and mix with the spoon; and because of this, the tub might leak with the excess oil. You need to mix the content of the tub well before you can use it. Once you apply on wet or moist skin, the crystals dissolve. This Forest Essentials body polisher is meant for only mild exfoliation and not for deep scrubbing. However, it does leave you smelling fresh and your skin well hydrated. The pack of natural ingredients is extremely beneficial for your skin in the long run. Indulge in some luxurious spa sensation all day long with the Forest Essentials Oudh and Green Tea Ultra Rich Body Lotion. 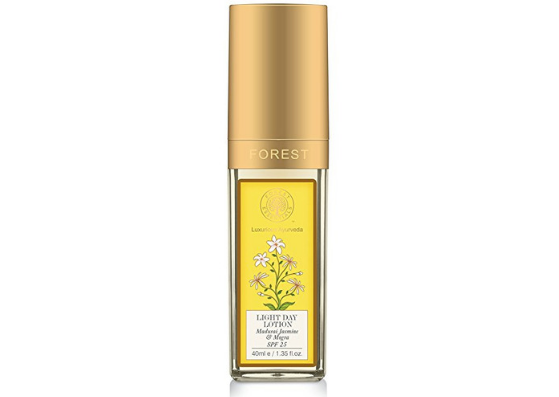 Here is a brilliant Forest Essentials body lotion that will leave you fragrant and glowing throughout the day. This product contains a precious collection of herbs and natural ingredients that pamper your skin. The steam distilled pure essential oil of Oudh or Agarwood is a traditional fragrant wood resin that soothes, warms and leaves the skin fragrant. Green tea cools the skin and also acts as a remedy for acne. Kokum butter and burnt cane sugar heal to keep skin moisturized and supple. Vitamin E and sweet almond oil are other ingredients that offer nourishment and protection from UV rays. If your hair is in need of some help, you should try this Forest Essentials hair oil for the best results you can imagine! 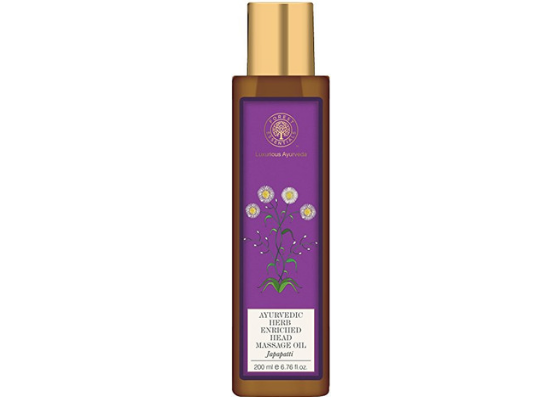 Get shiny and healthy hair with the Forest Essentials Ayurvedic Herb Enriched Head Japapatti Massage Oil. This Forest Essentials oil comes with rich coconut milk with pure coconut oil infused with hibiscus and japapatti leaf, also with the addition of sesame oil and herbs like brahmi, lodha, amla and reetha. 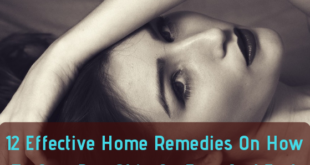 All of these ingredients are excellent at ensuring the best of scalp health. They nourish the scalp with their vitamins and cooling properties, protect the hair follicles, promote hair regrowth and also prevent hair fall. This oil comes in a very thin texture. The smell is herbal and the oil disappears into the scalp in no time. If you have dry scalp, you may end up using too much of this! It is thin, runny and easy to apply. After a hair wash using this oil you will notice less frizzy, well-tamed hair that is glossy with health! No kidding here, but it does work on keeping hair settled down and even has an effect on hair fall. 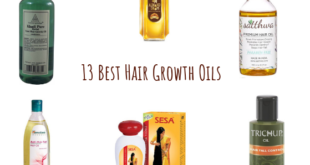 This oil is certainly worth investing in for good scalp and hair healthy down the years to come. Check out the goodness that Forest Essentials shampoo does to your hair and scalp with the Forest Essentials Hair Cleanser Bhringraj and Shikakai. The hair cleanser or shampoo is mild, filled with natural ingredients that will protect and nourish your scalp and hair. This Forest Essentials shampoo contains bhringraj and shikakai. Both of these ingredients help with hair fall reduction, hair regrowth, hair follicles nourishment, prevention against dandruff and keep hair smooth and luscious with shine. This Forest Essentials hair cleanser certainly lives up to those claims. It makes hair smooth and soft post wash that you may think of skipping out on the hair conditioner (which is not adviced though). 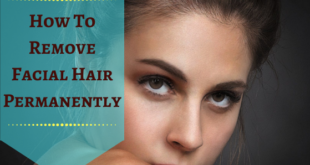 On the long run, you will also notice reduced hair fall, thicker hair, and less breakage. True to its claims. 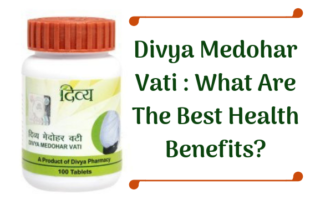 Works against hair fall, hair thinning, hair breakage, promotes hair regrowth, etc. Get nourished hair with Forest Essentials Hair Conditioner Amla, Honey, and Mulethi. This sweet smelling Forest Essentials hair conditioner is good for overall hair health with its beneficial ingredients like amla, mulethi, bhringrai, henna, raw organic honey, virgin coconut oil, etc. All of these ingredients help to keep the hair well nourished, hydrated, protected, reduce hair fall and also promote hair regrowth. 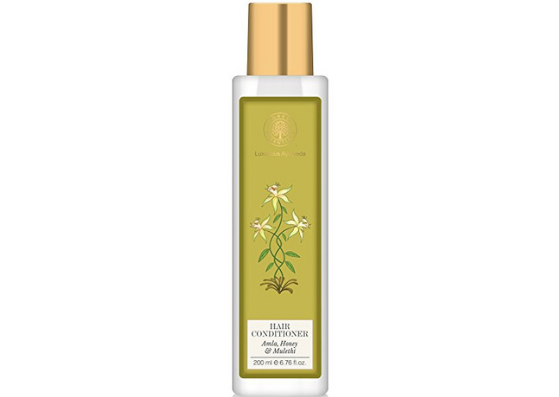 This Forest Essentials hair conditioner is thick, white in colour and comes in a bottle package. It spreads easily on the hair and washes off with ease. It does make the hair smell fragrant and also smooth, but nothing extraordinary for the price paid. It tends to weigh down the hair for oily hair or oily scalp people. Forest Essentials hair care products also have a very luxurious hair mask on their list. 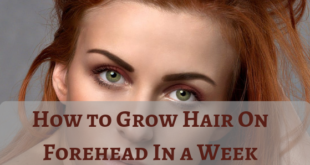 With a fair warning we go ahead that it works for some and for some it does not due to the climatic changes according to which some people’s hair responds differently. 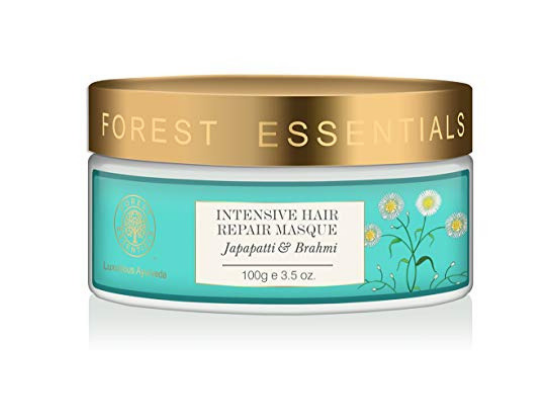 Forest Essentials Intensive Hair Repair Masque Japapatti and Brahmi has an extensive list of healthy ingredients like the remaining of Forest Essentials hair care products. It is very thick and creamy in texture. 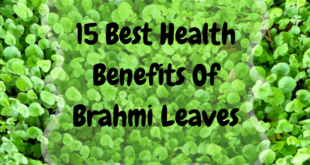 It contains babana pulp, japapatti and brahmi; all of which are healthy for hair and scalp health. 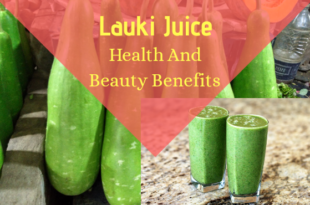 These contents that are rich in potassium, vitamins, and minerals help to prevent hair fall, strengthen hair follicles and also make hair shiny and smooth. This Forest Essentials hair mask is adviced to be used once a week in dry hair, whether alone or by whisking in an egg, since whole egg on hair is great for hair again! 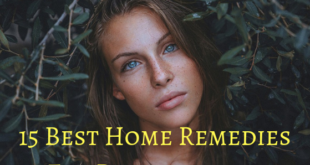 Overall, they assure good scalp health, but many women have gotten back on Forest Essentials product reviews that this hair mask does nothing to make hair soft or smooth. Rather some have found it dries out the hair strands. It could be due to the weather conditions. Nevertheless, the ingredients are worth trusting on. Do you want to add volume to your hair? 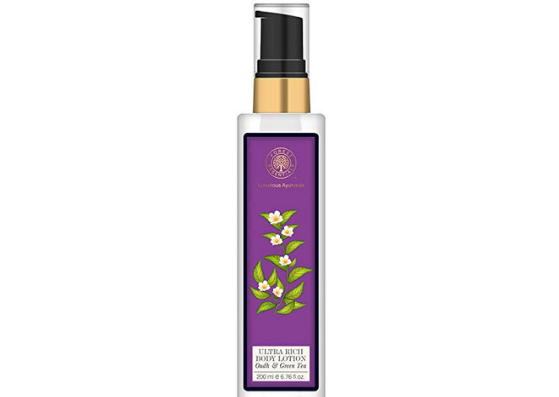 You must try the Forest Essentials Bhringraj and Shikakai Hair Thickening Spray. This Forest Essentials hairspray is a different addition to their Forest Essentials hair care range. It contains a wide list of ingredients that act as a magic potion for hair and scalp health. It is meant to treat and help to add volume, prevent hair fall and promote hair regrowth in hair. This Forest Essentials product is travel-friendly and plain water like hair spray that can be used like a regular hair serum or hair spray before styling hair. It does add volume to hair, it does reduce hair fall. But making the hair shiny or silky; does not work so for many. Again, it could be the harsh cold weather. Although the product claims it is suitable for all climatic conditions and is well suited for sensitive scalp, some Forest Essentials reviews also complain that this has caused some scalp itchiness. Except for this, this is a win to boost hair volume and density! 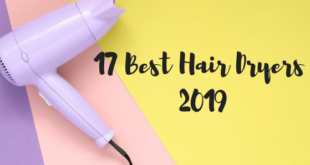 And we have reached the end of the 21 Best Forest Essentials Products for Face, Body, and Hair. Hope you found the Forest Essentials products reviews useful and do try the products. If you are a fan of Forest Essentials products and have any favourite do comment below!